I’ve written a script called yj2pwsafe which adds passwords exported from Yojimbo to Password Safe format database files. Password Safe is an open source password manager developed in part by Bruce Schneier. Many programs are compatible with Password Safe files. My script relies on code from Password Gorilla, a compatible application written in Tcl/Tk. Downloads, details, and instructions on Github. I’ve updated yj2pwsafe to be more user-friendly since I first posted this announcement; it is now packaged as an Applescript app that presents a series of dialogs like the one pictured above. Additionally, I’ve updated yj2pwsafe so that it can import serial number items exported from Yojimbo as well as password items. Posted on Tuesday, August 20th, 2013. Arcencode is my Tcl implementation of the compression algorithm used by both MapQuest and the Google Maps API to encode a list of coordinates as a printable string. It can be used, for example, to obtain a relatively compact representation of a route that can be passed as a single parameter value to a web map. The decoded coordinate list can be examined here. An important proviso: this encoding scheme is lossy. Specifically, coordinate values are rounded to five decimal places. Compare the input coordinates to the decoded output for an example. Any precision can optionally be specified, but greater precision compromises the amount of compression. (Note that the Google Maps API is only compatible with five-digit precision). How does this algorithm work? Google offers a technical step-by-step explanation. Essentially, compression is achieved by storing only the difference between each coordinate value and the previous value in the sequence; this requires fewer digits than storing each value in full, especially since precision is limited to a fixed number of digits. The values are packed into a printable Base64 representation in a way that eliminates the need for delimiters between coordinate values: values are bit-shifted left before output, and the ones place is used to mark whether the subsequent character represents a new coordinate or a continuation of the same value. Posted on Sunday, March 3rd, 2013. 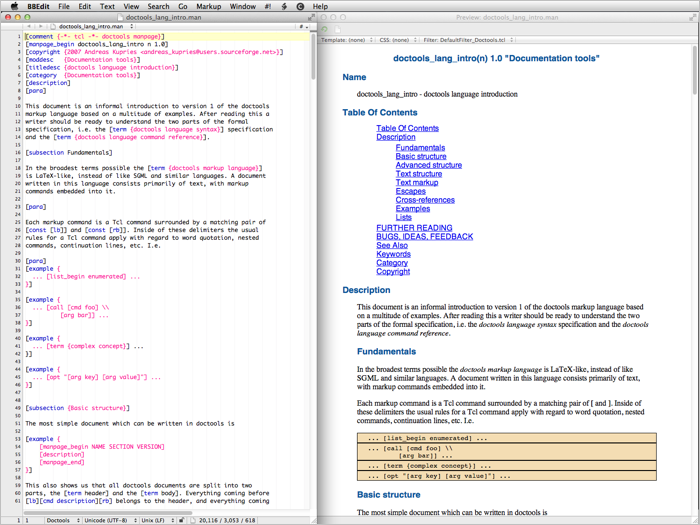 Doctools is a Tcl-based markup language suitable for writing software documentation. 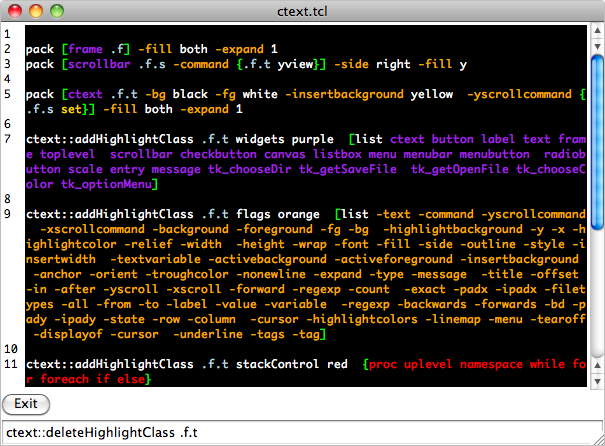 BBEdit is a Macintosh text editor. I made a Doctools language module (for syntax highlighting) and preview filter and posted them on Github as Tcl Doctools for BBEdit. Posted on Thursday, December 13th, 2012. Tcllib (the Tcl Standard Library) includes a number of user interface components, known collectively as TKLib. The documentation is good, but includes no illustrations or screenshots. Here are images of how a few of the visually interesting examples appear on Mac OS X 10.6.4 with Tcl/Tk 8.5.7. Posted on Wednesday, June 30th, 2010. In the past I have written a variety of posts about Starkits and Starpacks. 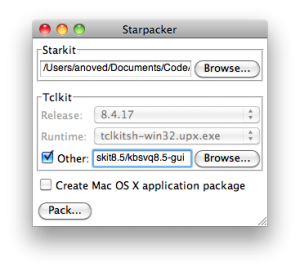 Briefly, Starkits provide a way to package complex Tcl/Tk programs in a single file, and Starpacks allow those packages to be combined with self-contained interpreters to deliver stand-alone applications. However, the Tclkit interpreters I originally used for this purpose have not generally been maintained, at least for Mac OS X (Pat Thoyts has done a good job providing current Windows and Linux versions). Of course, there are various ways to build your own Tclkit equivalent, but I usually found the process slightly too tedious to sustain my interest (although I did succeed with Pat’s version of kitgen shortly before discovering the method described below). As it turns out, self-contained Tcl/Tk installations functionally equivalent to Tclkits can quite easily be created with the kitgen build system. This comprises a single Tcl script (kbs.tcl) that automates the process of downloading, compiling, and assembling the elements of a “kbskit”. The script is robust – it worked successfully on the first try, without any knowledge of what options to use beyond those given in the Quick Start examples. If you simply run a fresh copy of kbs.tcl, it will retrieve the Tcl/Tk sources. On Mac OS X, these executables are found in the buildDarwin subdirectory relative to kbs.tcl. The subdirectory name will presumably differ on other operating systems. You can bundle other packages into your kbskits using the -mk-bi or -vq-bi options (-bi stands for “Batteries Included”). This will ensure that those packages (typically useful extensions) are always available to code being run by that kit. 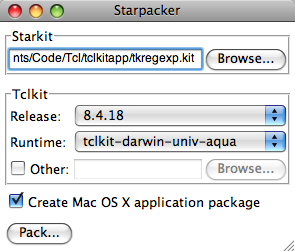 Of course, a different approach, with different advantages and disadvantages, is to bundle packages in your application Starkit, which can be executed with different kits. Additional topics to explore include building the --enable-aqua option and the best method to update both kbs.tcl and the source code it retrieves. Posted on Sunday, January 10th, 2010. LDTrim is a simple program that condenses or formats LDraw code by trimming extraneous characters like spaces – or inserting them to align values in columns. LDTrim was developed to help “pretty-print” examples for documentation or discussion, but it could also be used to reduce file size or to standardize the format of many models. Much of what LDTrim does is already possible with LDraw Design Pad. For example, see “Trim Lines” and “Auto Round Selection” under the “Tools” menu. 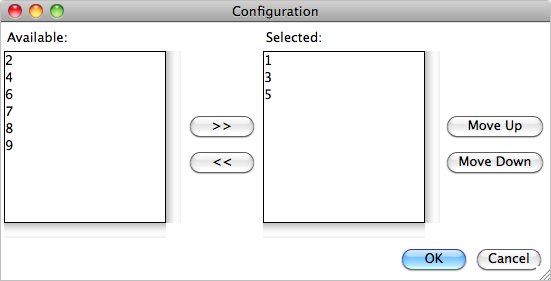 If multiple input files are specified without -out, they are modified in place. If -out is given with multiple input files, output is saved to that directory. reach the specified precision unless -trim zeros is explicitly specified. Whitespace between fields is condensed to a single space. The -width option pads values with spaces to reach the specified field width. If -width max is given, the widest value is used as the width for all fields. is wider than the requested width, that width is used as the field width. Right justification is used if -width or -1..15 is specified without -justify. If none of -width, -1..15, or -justify is specified, fields are unaligned. If environment variable GATEWAY_INTERFACE is defined, LDTrim is a CGI script. Giving a minimum field -width argument implies -justify right. 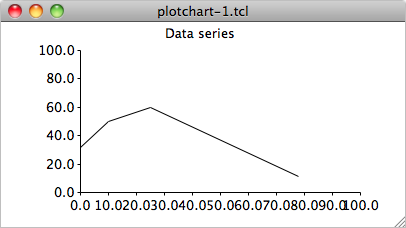 Similarly, decimal -precision implies -trim none, leaving trailing zeros intact. The -1 and -2 options override the minimum width for the first two columns. If LDTrim is given multiple input files, it will process them all, saving the results to files of the same name in the directory given by -out or overwriting the input files if no output folder is given. Note that with a single -in file, -out is interpreted as a single output file, but with multiple -in files, -out is interpreted as a directory to contain the results. LDTrim has a rudimentary web interface built in. If the GATEWAY_INTERFACE environment variable is detected, LDTrim will behave like a CGI script. Specifically, it will print an HTML form with controls that roughly correspond to its command-line options. LDraw code posted via this form (to itself, as the action ldtrim) is processed according to the selected options. The results are returned in the same form. LDTrim is also available as a platform-independent Starkit (50 KB) which requires an 8.5 Tclkit. The current version of LDTrim is 1.1; it fixes a bug that caused malformed line endings to be output on Windows. Posted on Saturday, May 10th, 2008. So if you’ve got an ordered list of values you’d like to access as named fields, you can combine it with a list of field names using foreach and be on your way. Posted on Monday, April 28th, 2008. 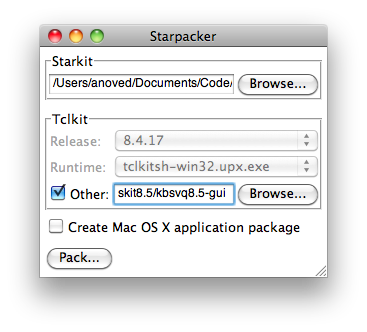 Starpacker is a utility that helps join Starkits and Tclkits to create stand-alone Starpacks. This can already be done with SDX, which is a superior tool in many ways, but Starpacker provides a simpler interface to this particular aspect of SDX. More extensive help is included with the program. I recommend watching the video full screen for maximum clarity. Posted on Wednesday, March 26th, 2008. 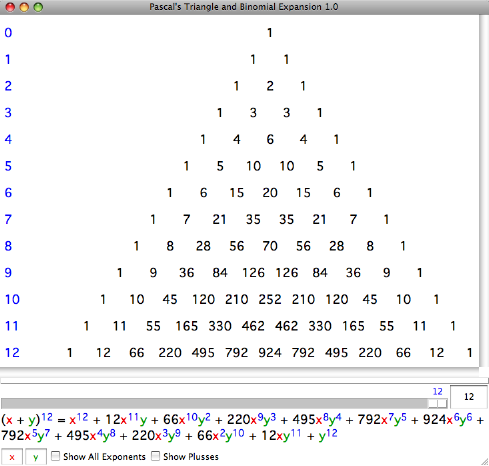 Recently I was introduced (or perhaps reintroduced) to Pascal’s Triangle, an arrangement of integers that lends itself to a variety of purposes, including binomial expansion. I’ve written a little program to explore this aspect of the idea. 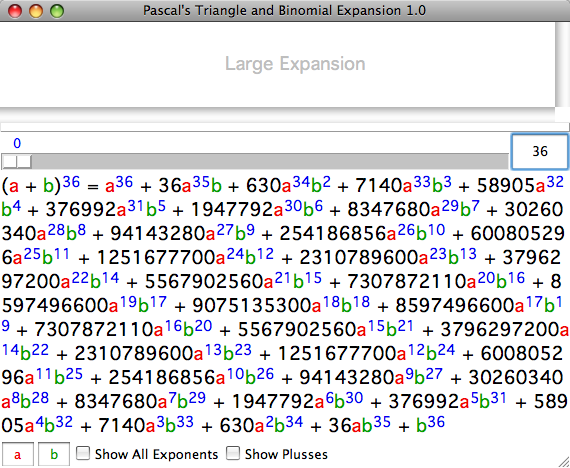 Interactively adjust the degree of the expansion to see the corresponding triangle. Change the binomial terms for clarity or convenience. Show exponents of the first and zeroth power to illustrate that the total degree of each term matches the degree of the initial expression. 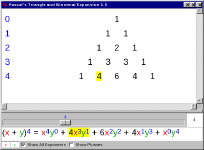 Show plus symbols in the triangle to emphasize how each row is the basis for the next. 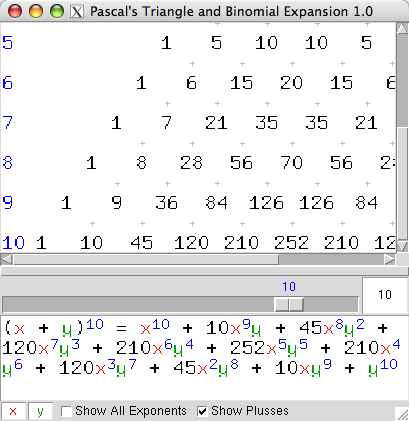 Mouse-over highlight of corresponding terms in triangle and expansion. Binomial expansions to any degree can be computed (although the triangle is only displayed for small values due to limitations of the current layout spacing). 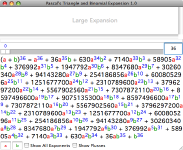 Click and drag in triangle to scroll or drag divider to adjust size of expansion pane. Other: pt.tcl.zip 2.3K or pt.kit.zip 2.8K; requires Tcl/Tk 8.5 or a corresponding Tclkit, respectively. The Mac OS X and Windows versions are self-contained (and hundreds of times larger, unfortunately). Posted on Monday, February 25th, 2008. The Tcl core library includes msgcat, a package which facilities program localization. msgcat provides means to define a catalog of messages in multiple languages and a procedure to retrieve messages appropriate to a specific locale, typically determined by cues from the operating system. In general, to localize puts "Hello, world! ", you provide equivalent strings for each supported locale and select the appropriate one at runtime by stating puts [mc "Hello, world!"]. For example, this command might print ¡Hola, mundo! if the locale is es. Default strings in the programmer’s native language can usually be used as keys to the message catalog. 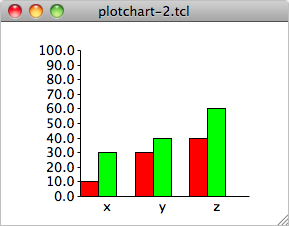 It is also available from within Tcl as the variable ::tcl::mac::locale. See QA1067 for more information about environment.plist, including how to create it if it does not already exist. Note that variables defined in this file will be visible to all programs, and may therefore affect other applications. Posted on Tuesday, January 29th, 2008.